Zephyr® is a leading test management software available as Zephyr® Enterprise Edition and as add-on for JIRA® on-premise or JIRA® cloud solutions. With Zephyr® on JIRA Cloud companies can create, plan, and execute tests right inside of their JIRA® cloud instance. The BPM-X® team has developed an integration link for a project between BPM modeling tools such as ARIS®, CaseWise, SPARX Enterprise Architect, Microsoft Visio® and many others to generate test-cases and scripts right out of the business process models and diagrams and to instantly load them into Zephyr® on JIRA®. BPM tools are used in the blueprinting phase of software and IT applications to document the workflows and requirements of business processes. 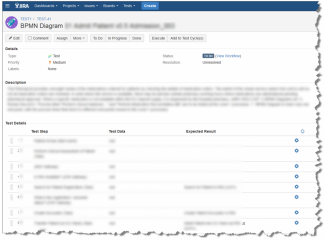 A very widely used tool for test management is JIRA with the add-on Zephyr which is available as add-on for JIRA® on-premise and cloud solutions. As input for test-cases and test-steps a process diagram is used. 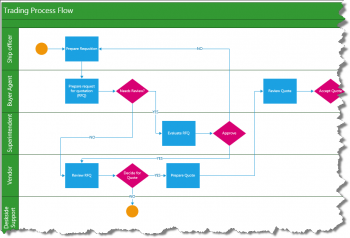 The following example shows a Visio® swimlane diagram with a process flow like a cross functional flowchart or BPMN that is used to generate test cases. The BPM-X® converter tool reads the Visio® 2013 VDX file and runs a simulation of possible end-to-end paths. For each end-to-end path an internal test-model is calculated. For each test-model a test-case is generated in an XML file that can be uploaded into Zephyr on JIRA. The XML implements the TestLink XML XSD scheme and allows to store several test cases in the XML. The screenshot below shows 3 test-cases generated from the process flow diagram. The number of diagrams is depending on the so called coverage algorithm. This algorithm minimizes the number of test-cases e.g. to cover at least all activities, all transitions between activities or all paths through a process diagram. Sensible data in the screenshots is grayed out for confidentiality purposes. The test-model is a sequence of activities to be executed in a test-case. These activities are defining the test-steps also known as test-script. The test-steps include the step name, test data if any defined and the expected result. The description is taken from the process diagram description and loaded into the JIRA® standard field of the issue description. The number and types of fields is limited to the support of fields in the TestLink XSD. Based on customer requirements the team plans to support the REST web service interface available for JIRA® on-premise and Zephyr® (so called ZAPI) and the Zephyr® Enterprise Solution. The use of REST will avoid the use of an intermediate XML file and allows to directly load all test cases into the Zephyr® tool.